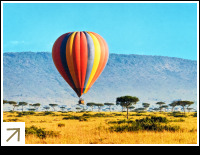 What better way to start the day could there be than rising gently above the plains of Africa in a hot air balloon? As you ascend, dawn begins to creep over the horizon, illuminating the landscape in an ethereal light and setting the scene as the animals begin to stir and a new day begins. As you float in the air you will have a bird's eye view of the wildlife and there will be some excellent photos opportunities. The experience is exhilerating and for many it is the highlight of their holiday. Usually the pilot will bring the balloon down beside tables laden with breakfast. You can top off your balloon trip with a glass of orange juice in the bush, or if you want, a glass of champagne. Please note - balloon trips are usually included as an optional extra on our tours so please check the itinerary for details of any extra charges.